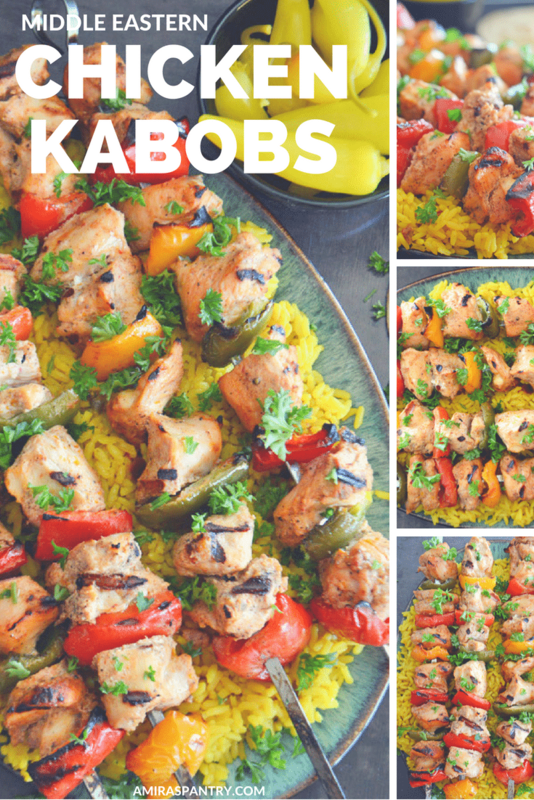 This Middle eastern chicken kabobs are yogurt marinated chicken kebabs, tender and so tasty. These chicken skewers are so popular in the Middle East. 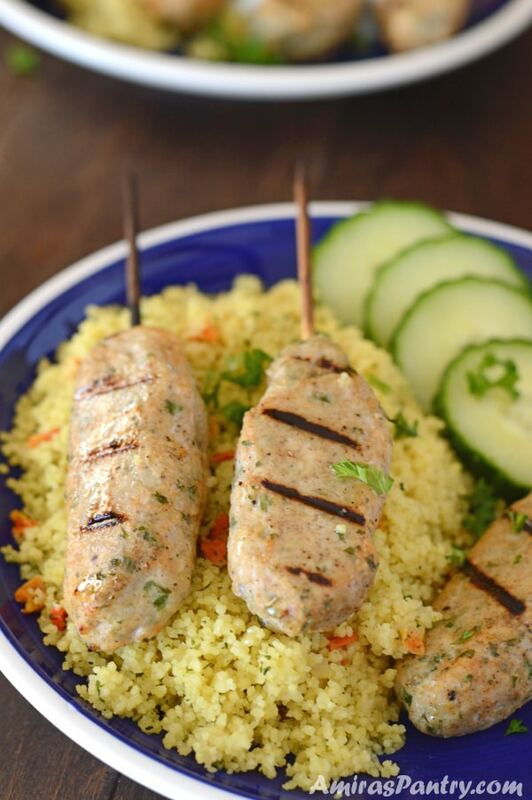 If you are more into skewers like us, check our latest ground chicken kabobs. 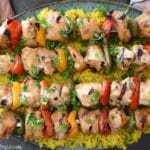 This is an easy yogurt marinated chicken kebabs recipe that results in a fabulous tender and spicy chicken. 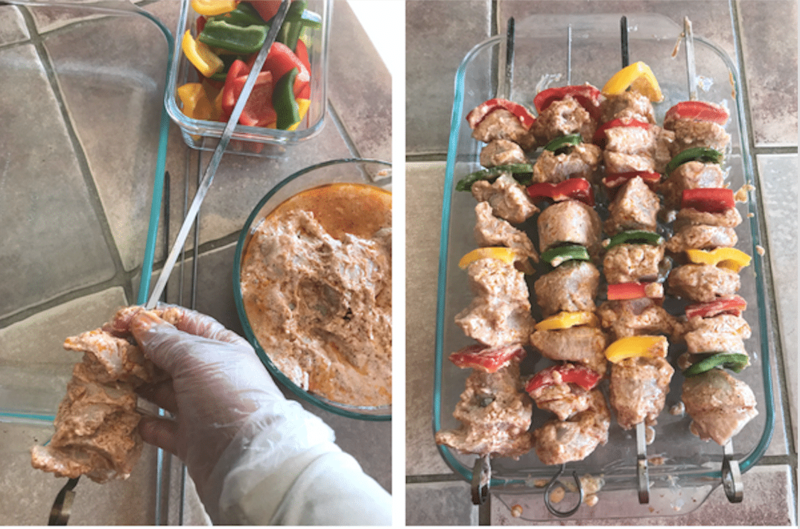 The marinade of this chicken was inspired by my recipe for Beef Shish Kabob. Somehow the combination of yogurt, garlic and lemon never fails me in any grilled meat and this recipe is no difference. 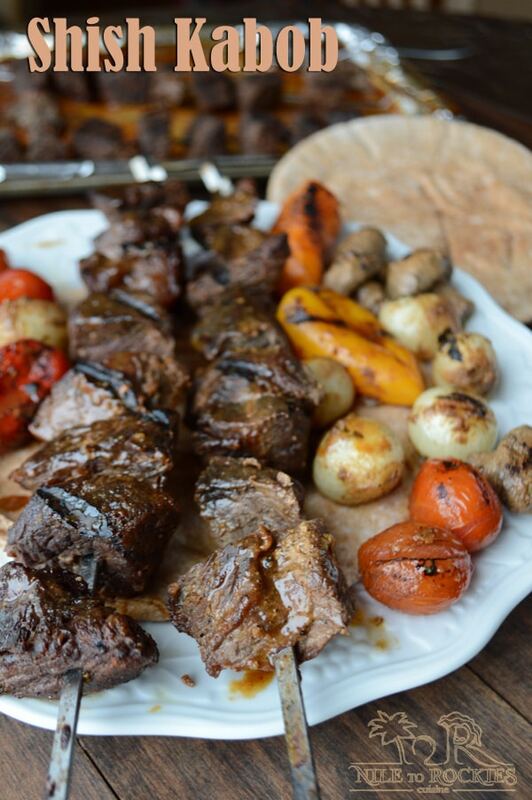 In the Middle East grilled meat or kabobs are wildly popular and loved. There are tons of recipes out there for it and every family have their own favorite spice mix, yet almost always you’ll find yogurt, lemon(sometimes vinegar too) and garlic in the marinade. 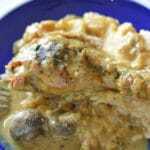 Yogurt, lemon and vinegar work as a tenderizer for the chicken plus giving the chicken a delicate tangy flavor. So, What is traditional Kebab? Kebab, Kabob or Kabab is a wide variety of grilled meat usually on skewers. This includes beef, lamp, chicken and even shrimps. 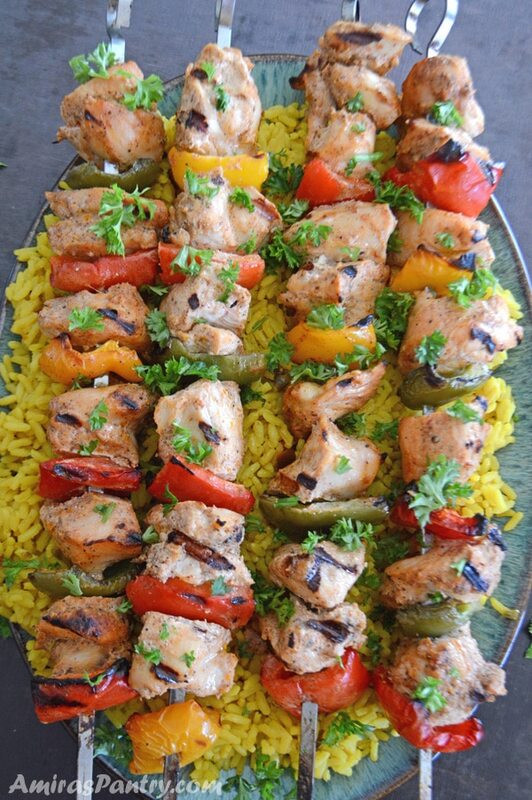 Kabobs can but made with ground meat or cut up ones. What is the difference between shish kebab and doner kebab? Doner Kebab is sort of vertically layered meat like shawarma and being cut off with a long knife while traditional kebab are skewers of ground meat or cubed meat that is grilled. Can I use wooden skewers? Absolutely, just do not forget to soak them in water for like 30 minutes before threading and grilling. 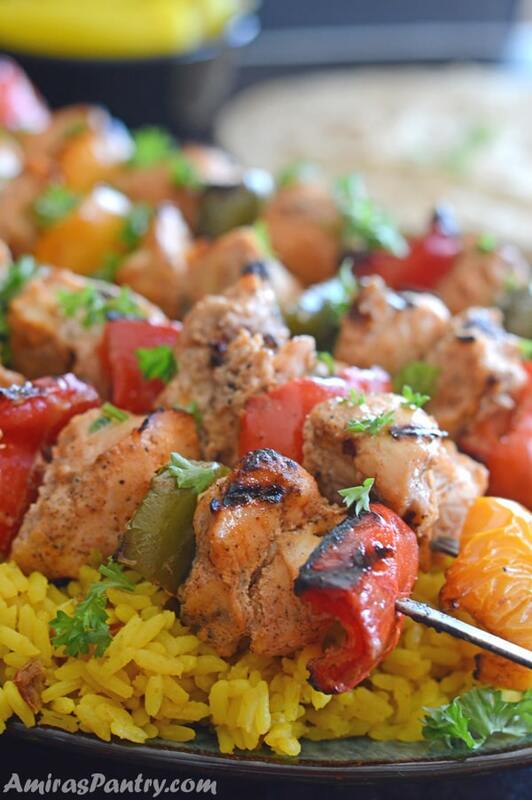 What is the right temperature for grilling chicken kabob? I thread both chicken and veggies on the skewers at the same time so I need to cook them both without getting the veggies to burn. As a rule of thumb, I Place my hand about 2 inches over the heated grill surface, if I can hold it there for 3 seconds then it is the right temperature, if not then may be it is too hot and I reduce the temperature a notch. How to bake chicken kabob in the oven? It is easier than you think. Place skewers on a lipped baking pan lined with oiled foil and bake on 425F oven for 10 minutes then turn it to the other side and bake for more 10-15 minutes. Or, broil on high 5-7 inches from the flame for about 8-10 minutes on each side depending on the size of the chicken. 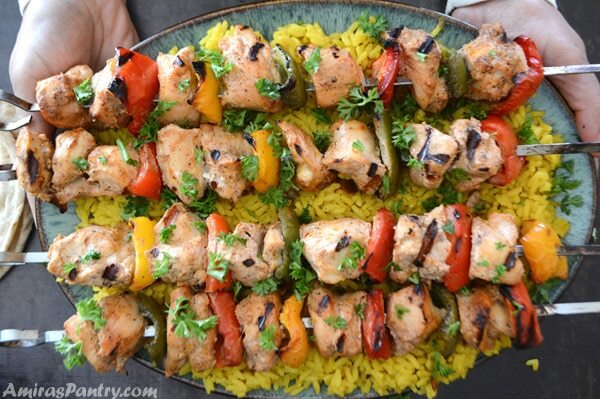 How to serve chicken Kabobs? My favorite is to sandwich them in pita bread and topped with tahini, toumeya, baba ghanoush or hummus. My men like eating it right off of the skewers, they like holding the skewers and eating from it with rice. We’ll need to mix all the marinade ingredients in a deep bowl. 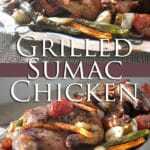 Add cubed chicken in tossing them and coating them well, cover and refrigerate for up to 24 hours. Thread chicken with bell pepper in skewers then grill or bake in the oven as started above until done thoroughly. One last note: I’ve used harrissa in the marinade and it was terrific. I’ve actually used 2 Tablespoons but stated only one in the recipe below in case you do not like heat that much. If you do not have harrissa, you can use cayenne pepper for heat. 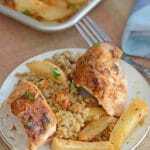 This is a recipe that shows up frequently year round on our dinner table, freezer friendly and so easy to make. 1/2 Tablespoon salt or to taste. 3 medium bell peppers any color you chose. In a large bowl, add all the ingredients except for the chicken and mix well. Add chicken and toss to coat well. Cover and refrigerate from 3 to 24 hours. Preheat your grill to medium-high heat greasing very well. Thread onto skewers alternating occasionally with the bell peppers. Grill chicken until golden brown and cooked through, turning it occasionally. 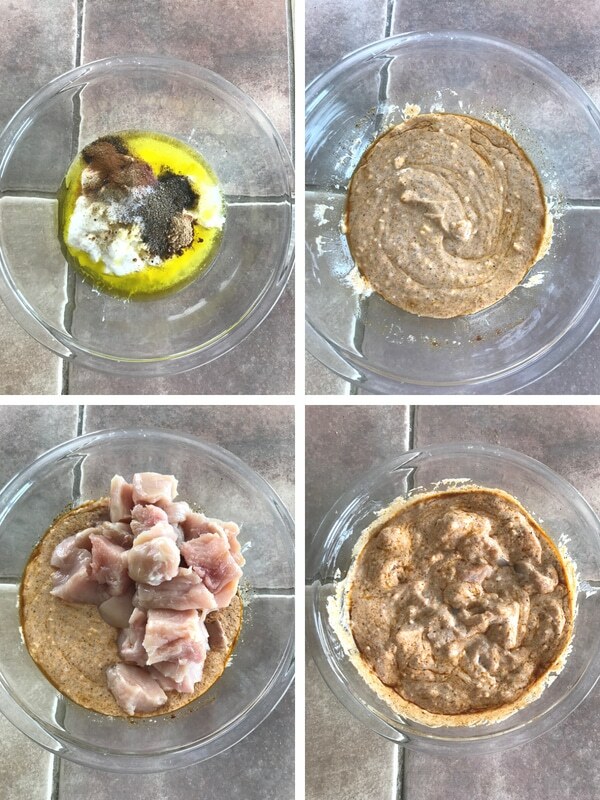 * You are welcome to use chicken thighs in fact I recommend it more than the breasts as it is mush juicier and does not dry easily like breasts. ** For oven baking, see instructions on the post. Thank you for trying this recipe. I am glad you all loved it. 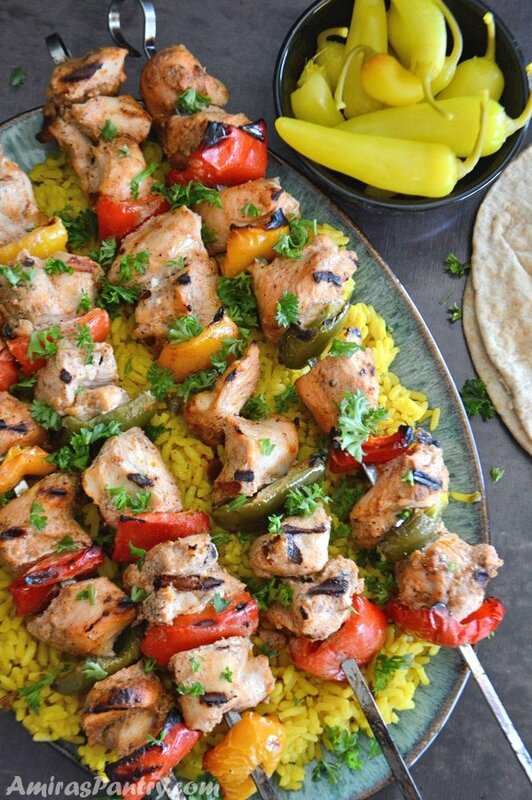 Your dish of kabobs on the yellow rice looks so tempting. Thanks for sharing, from the sound of the marinade I know they will be delicious. Fabulous recipe Amira and I love the tip on checking the heat by holding your hand by the heat. Thanks Eve, I do not remember who gave me this tip long time ago but it never failed me :). So happy grilling season is here! And what’s better than a kabob to grill? Chicken ones are perfect, too — loads of flavor and pretty healthy. 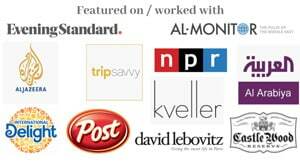 Good stuff — thanks. Thanks John, I hope you’ll try it this summer.